From Regulatory Texts to BRMS: How to Guide the Acquisition of Business Rules? 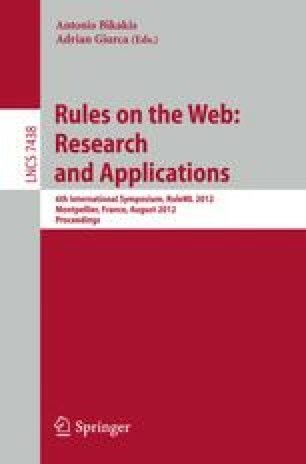 This paper tackles the problem of rule acquisition, which is critical for the development of BRMS. The proposed approach assumes that regulations written in natural language (NL) are an important source of knowledge but that turning them into formal statements is a complex task that cannot be fully automated. The present paper focuses on the first phase of this acquisition process, the normalization phase that aims at transforming NL statements into controlled language (CL), rather than on their formalization into an operational rule base. We show that turning a NL text into a set of self-sufficient and independent CL rules is itself a complex task that involves some lexical and syntactic normalizations but also the restoration of contextual information and of implicit semantic entities to get a set of self-sufficient and unambiguous rule statements. We also present the SemEx tool that supports the proposed acquisition methodology based on the selection of the relevant text fragments and their progressive and interactive transformation into CL rule statements. This work was realized as part of the FP7 231875 ONTORULE project ( http://ontorule-project.eu ). We thank our partners for the fruitful discussions, especially to John Hall (Model Systems) for introducing us to the SBVR world and to Audi for the collaboration on their use case. We are also grateful to American Airline who is the owner of one of our working corpora.